I got together with Mark Kibort, designer of the eRAM and Super eRAM Electric Superchargers on Tuesday, 7/29. 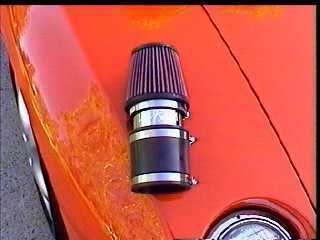 We installed (rigged with gaffer tape) an eRAM electric supercharger on my '94 Stealth base NT (which already was slightly modded with K&N FIPK and resonator removed), doing before-and-after dyno runs to determine if it does yield any real world HP gains. Well, it works, and even with a less than optimal 'quickie' install, (blowing air at around 40 degrees angle at the MAS honeycomb, instead of straight-on), we got a real 5 HP in the entire range of 3000 through 5500 RPM. We had clear repeat readings (3 runs each on the dyno at Frey Racing in Mountain View) of 170 HP before, and 175 HP after installing the eRAM. We met at 'The Dyno Room' at Frey Racing, which is a company that's been around for 40 years and have respect in the racing community. Judging from a dozen or so NASCAR types and SCCA entries in the shop, I'd venture that these guys know what they're doing. All they do is try to squeeze every available horsepower from the cars they work on. Our little test on my car (with roughly 1/3 the HP of any of the other cars in the shop) was treated with great respect by their dyno guy, a soft spoken ex-racer named Terry Barnard (who had some interesting suggestions for us...). He had me start at 2000rpm, then take the car through 2nd & 3rd to 4th gear and hang at 2000rpm... When he said "go", I banged it to WOT through 5500rpm, then backed off and threw it in neutral. It really felt like driving at 120mph (what it said on the speedo), between the engine noise with the hood open and an humongous fan blowing cool air over the engine (the fan was as wide as the Stealth)! Just an aside (for you Bay Area folks)-- Frey Racing will take a group of our Team3S S/3ks on one of their weekend "Dyno Days" and dyno your car for $60! 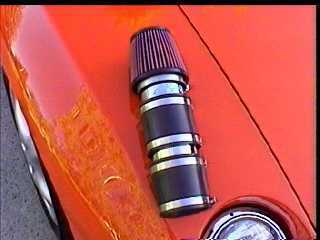 Although the eRAM was impressive as hell, I'm almost as excited by what Terry, Mark (and Mark's dad Bob, a former aeronautical engineer) had to say about the segmented intake 'hose' on our cars: It steals horsepower! The friction created by all those segments, nooks and crannies is slowing us down. My summer project (which has now turned into a 'following-spring' project! ), will be to pull out all my old engineering books, and try to design a smooth intake tube that reduces some of the air resistance that our present system creates. Any and all input or assistance you folks can give me in this endeavor is encouraged!!! They give Team3S members a 10% discount! eRAM Photographs ©1998-2004 Mark Kibort, All Rights Reserved.